On September 10, 2011 it`s introduced a new procedure of obtaining visas for foreigners in Ukraine, and it`s abolished many types of visas. Thus, at present there are 3 types of visas: transit, short-term, long-term. Transit visa (denoted by the letter B, (VB)). It is issued to foreigners to transit through the territory of Ukraine. A transit visa can be single, double entry, reusable, and issued for a period of 1 year. The length of staying in Ukraine must not exceed 5 days. Short-term visa (denoted by the letter C (VC)) is issued to foreigners to enter Ukraine for a period up to 90 days for 180 from the date of first entry. Short-term visa may be single, double entry, reusable. Long-term visa is marked with the letter D (VD) and is issued to foreigners to enter Ukraine with the purpose of paperwork to stay for more than 90 days. Long-term visa can be disposable, double-entry. reusable up to 3 years. Other documents required by international regulations. Also, in connection with the entry from December 25 of the Law of Ukraine "On Legal status of foreigners and stateless persons" of the visa may be denied because of absence of health insurance for foreigners. 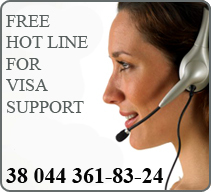 You can use the services of our company visa support to obtain a visa to Ukraine.